With the aid of our rich industry expertise, we have been able to emerge as a trusted name in the domain of Wedding Caterers. 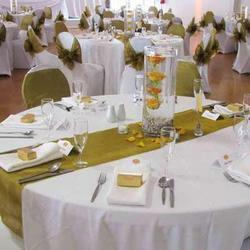 Since our formation, we have been engaged in rendering the best quality catering service to our esteemed patrons. In addition to this, we are dedicated to fulfill the diversified requirements stated by our valued clients. Food served by us in these occasions is prepared using the best grade ingredients in the most hygienic conditions. Our endeavors are to make the clients' event to be a memorable one, for that matter all our team of chefs, serving staff, floor managers and allied personnel work hard.